Pasaquan opened to the public on October 22, 2016 after two years of structural repairs and intense art conservation work by Kohler Foundation. As Eddie Owens Martin -known as St. EOM - would say, the past, present, and future all come together at Pasaquan. And, indeed, they have. Pasaquan was gifted to Columbus State University in Columbus, Georgia, and is now open to the public. A collection of St. EOM’s art was gifted to the John Michael Kohler Arts Center in Sheboygan, Wisconsin and will be on display beginning January 15, 2017. 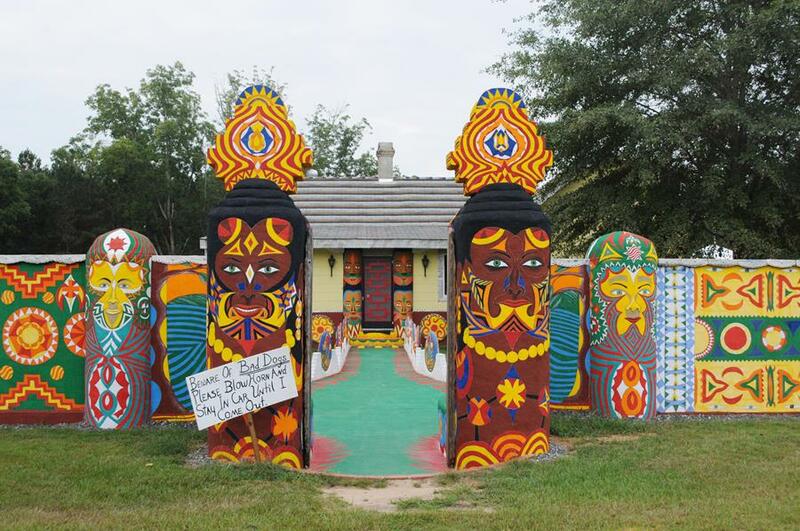 The Folk Art Society of America's 29th Annual Conference will be held in St. Petersburg, Fla., November 3-6, 2016, with the theme "Florida and Latin-American Folk Art and Artists." Visits are scheduled to the Tampa Museum of Art; the Museum of Fine Arts, St. Petersburg; the Dali Museum; the Chihuly Museum; galleries and private collections. Rebecca Lieb: You just spent eight years doing these two portraits, one of you and the companion piece of Whitney [Ward, Coleman’s wife]. Was it a conscious decision to dedicate eight years to this project? Joe Coleman: It was a conscious decision to commit when I started my big self-portrait [Doorway to Joe, 2015]. The self-portrait took over three years. Then I did these series of miniatures which, in my mind, were like satellites around the bigger self-portrait. Things I wanted to say that somehow didn’t make it onto the planet. So it has these orbiting miniatures. And when I’d finished the miniatures, I knew that I wanted to do another large painting, and the only painting that my gut and heart told me was this companion for the big self-portrait. Then, I knew it would have to be of Whitney [Doorway to Whitney, 2015]. RL: A literal companion, and the first time they’d ever met was at the “Unrealism” exhibition at the Gargosian Gallery [Miami, December 2–6, 2015 - see Raw Vision 88, page 69]. Image above: Doorway to Joe, 2007-2009, acrylic on panel, 85.5 x 41.4 ins. / 217.3 x 105.2 cm. 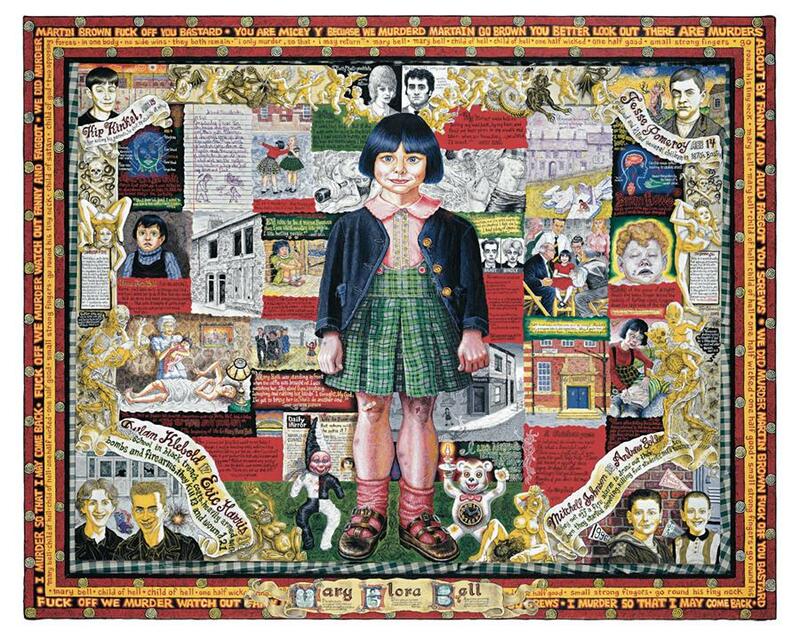 Image below: And a Child Shall Lead Them, 2001, acrylic on panel, schoolgirl’s uniform, 28 x 34 ins. / 64 x78 cm. JC: Yeah, that’s the fun part, and it was exciting for me to see them together. RL: But just going back to eight years, that’s the longest you’ve ever spent on one project. So was that a decision? Was that just something that came out of the circumstance? JC: Well it was a decision that’s made in the same way that I produce the work, which is slowly. So I wanted to challenge myself in every way: physically, by making the piece both bigger in size, but also more minute at the same time. I wanted to challenge myself in the commitment: previously, I’d spent a year producing one painting, and I don’t work on other paintings at the same time. I can’t. I also wanted to challenge myself, choosing subjects that are even more personal so it’s more emotionally challenging, and spiritually and physically because I don’t know if my hand and my eye are still going to have those same abilities. I have them now, but that could change tomorrow. And I was thinking it’s likely that your abilities become less and less, and you become physically challenged when you get to the other side of the ladder - I’m at the precipice, so I wanted to push myself and challenge myself in all these ways.